This week on Facebook I ran into a couple of memes about the defense budget that I thought were worth addressing. While the core message that the United States spends too much on the military is sound, these particular memes are so massively misleading that I think it would be irresponsible to let them go unanswered. First of all, this graph is outdated; it appears to be from about five years ago. If you use nominal figures for just direct military spending, the budget has been cut from just under $700 billion (what this figure looks like) in 2010 to only about $600 billion today. If you include verterans’ benefits, again nominally, we haven’t been below $700 billion since 2007; today we are now above $800 billion. I think the most meaningful measure is actually military spending as percent of GDP, on which we’ve cut military spending from its peak of 4.7% of GDP in 2010 to 3.5% of GDP today. It’s also a terrible way to draw a graph; using images instead of bars may be visually appealing, but it undermines the most important aspect of a bar graph, which is that you can easily visually compare relative magnitudes. But the most important reason why this graph is misleading is that it uses only the so-called “discretionary budget”, which includes almost all military spending but only a small fraction of spending on healthcare and social services. 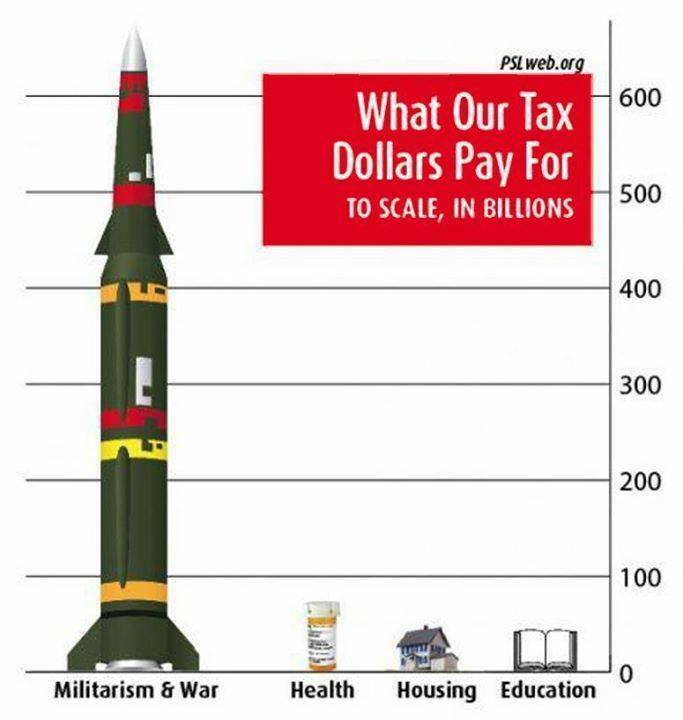 This creates a wildly inflated sense of how much we spend on the military relatively to other priorities. In particular, we’re excluding Medicare and Social Security, which are on the “mandatory budget”; each of these alone is comparable to total military spending. 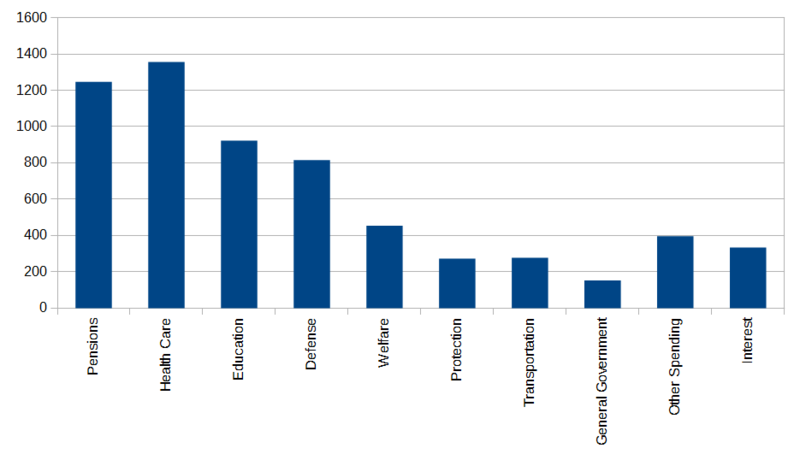 Here’s a very nice table of all US government spending broken down by category. Let’s just look at federal spending for now. Including veterans’ benefits, we currently spend $814 billion per year on defense. On Social Security, we spend $959 billion. On healthcare, we spend $1,018 billion per year, of which $536 billion is Medicare. We also spend $376 billion on social welfare programs and unemployment, along with $149 billion on education, $229 billion servicing the national debt, and $214 billion on everything else (such as police, transportation, and administration). 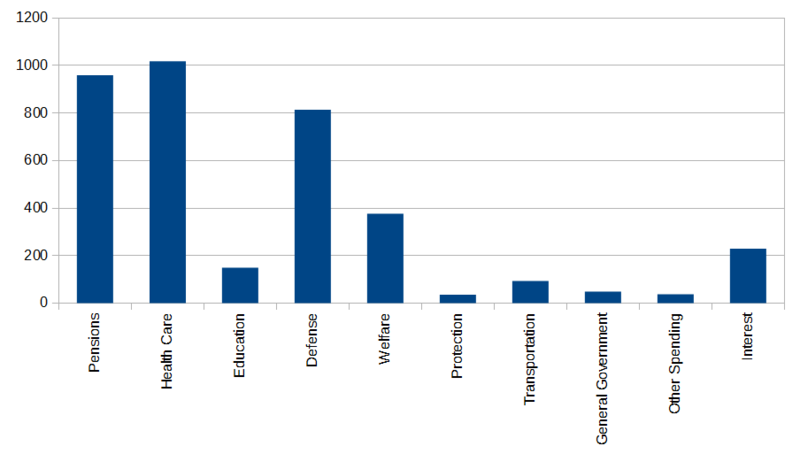 As you can see, the military is one of our major budget items, but the largest categories are actually pensions (i.e. Social Security) and healthcare (i.e. Medicare and Medicaid). Given the right year and properly adjusted bars on the graph, the meme may strictly be accurate about the discretionary budget, but it gives an extremely distorted sense of our overall government spending. Again the figures aren’t strictly wrong if you use the right year, but we’re only looking at the federal discretionary budget. Since basically all military spending is federal and discretionary, but most education spending is mandatory and done at the state and local level, this is an even more misleading picture. 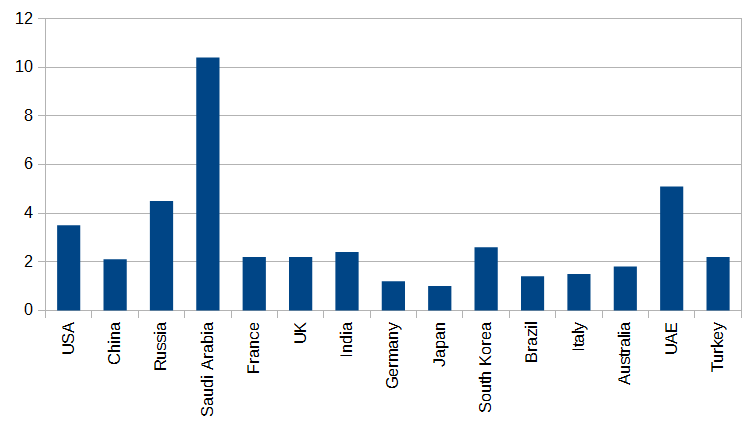 Total annual US military spending (including veteran benefits) is about $815 billion. Total US education spending (at all levels) is about $922 billion. 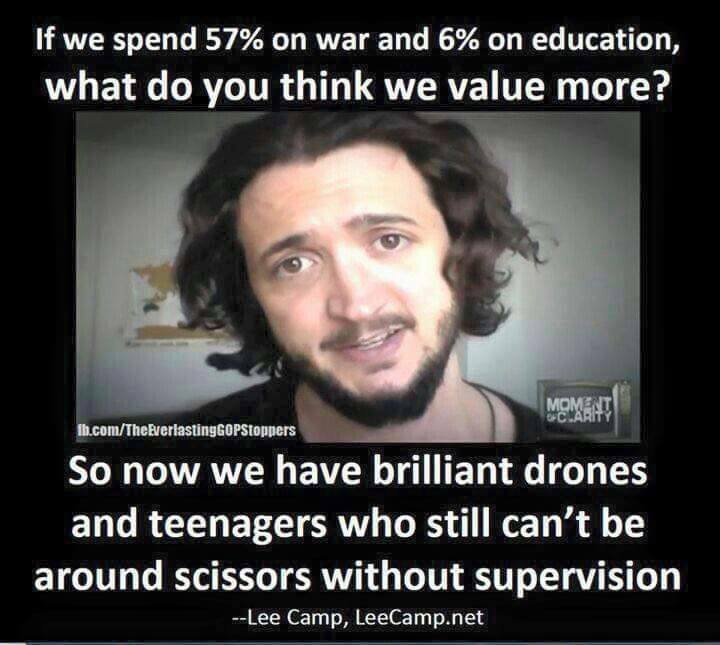 That is, we spend more on education than we do on the military, and dramatically more on healthcare. However, the United States clearly does spend far too much on the military and probably too little on education; the proper comparison to make is to other countries. Most other First World Countries spend dramatically more on education than they do on the military. France, for example, spends about $160 billion per year on education, but only about $53 billion per year on the military—and France is actually a relatively militaristic country, with the 6th-highest total military spending in the world. Germany spends about $172 billion per year on education, but only about about $44 billion on the military. In absolute figures, the United States overwhelms all other countries in the world—we spend as much as at least the next 10 combined. Using figures from the Stockholm International Peace Research Institute (SIPRI), the US spends $610 billion of the world’s total $1,776 billion, meaning that over a third of the world’s military spending is by the United States. 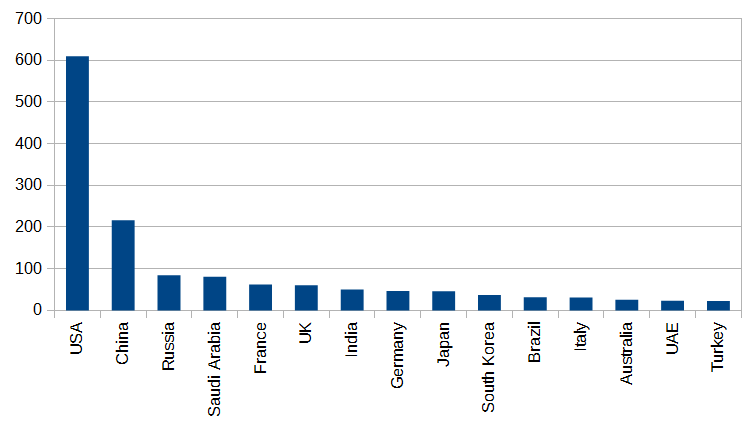 This is a graph of the top 15 largest military budgets in the world. 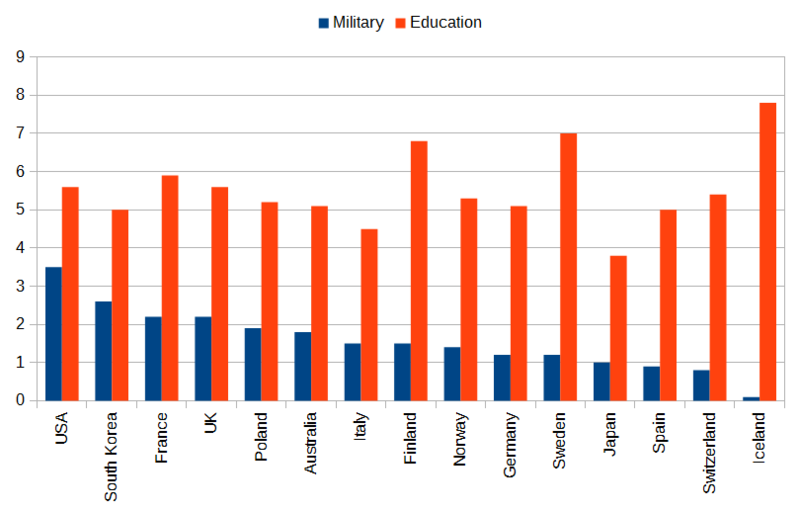 Our education spending is about average (though somehow we do it so inefficiently that we don’t provide college for free, unlike Germany, France, Finland, Sweden, or Norway), but our military spending is by far the highest. How about a meme about that?